This morning I woke up to learn that Said Aql, a poet, philosopher and erudite passed away at the age of 102 in Lebanon. To many in the old country, he was a "giant," and to many more he was called "al Muallem," the teacher. His passing brought me back decades in time to Beirut, my city of birth to remember Said Aql, whose intellectual legacy cannot be separated from modern Lebanon. No one from all those contemporaries to Aql was alive the day he left this world. He was an author already in the 1930s. His poetry was like an endless river, flowing, growing and spreading. He was part of a Lebanese and Arab generation of poets, writers and philosophers whom we studied as of middle school, yet he survived for many years while other departed. He was this unreachable giant, as we grew up in Beirut and memorized his poems. He was to us, in Arabic literature classes, the equivalent of Moliere, Racine and Victor Hugo, whom we studied in French literature classes. I never thought I'd actually meet him one day; he was half a century older than me. But on a winter evening of 1972 my older brother Sami, a law student then and a philosopher on his own asked me if I'd like to meet "the Said Aql." I was thrilled to meet a poet "from my literature's book. The apartment where the gathering took place was filled with friends and supporters, mostly from the Lebanese University. Said Aql wasn't just a man of literature, he was also a nationalist, in fact one of the founders of the Lebanese Nationalist idea. I discovered the man under a different light. He was speaking of "mother Phoenicia" like I have never heard before. The way he described it was Hollywoodian but many of the facts he spoke about, I rediscovered over the years, including decades later in my adopted homeland, America. My father attorney Halim Phares who knew "al Muallem" since law school at Saint Joseph in the late 1930s, had told me since my childhood about this generation of "founding fathers" of the idea of a historic Lebanon, preceding all empires, including Fuad Afram Bustani, Yousef al Sawda, and Paul Noujaim. Everything I heard from my father about Aql got multiplied when I heard the man. He was surreal, his voice was crossing centuries. As if he was a witness from thousands of years ago. "Everything was invented by the Phoenicians, they discovered every land under the sun," he kept telling us. Since that soiree Said Aql became real to me, despite his wide and rich imagination. During the years preceding the war of 1975 he launched and mentored a small political party by the name of "al Talai al Tabaduiya" (the Vanguards of Amazement, or so). He still promoted "Lebanese Nationalism" but took it to the universal level. Lebanon became a global necessity, a teacher from Antiquity and a founder of Universal Civilization. Compared to the actual size of the country and its military weakness, Aql's titanic ideas leaped beyond and above any political narrative in Lebanon. Said Aql was speaking as if his country was Germany, Russia or China, yet made many Lebanese dreaming. The one aspect where he excelled was to uncover the individual achievements of Lebanese emigres around the world. His vision of the "Lebanese world" was about millions of men and women who left the homeland because of poverty or persecution, yet became producers of culture, technologies and public service, around the world. The difference between Aql's painting of the Lebanese people as individuals, and the narrow labyrinths of Lebanon's politicians was stark. In fact -as for Lebanese-American writer Khalil Gebran- Aql believed that Lebanon was blessed with its nature and its people and cursed with its political leaders. During the war, we had the opportunity to visit the poet during the famous literary Tuesdays in Ashrafieh, in Beirut, hosted by another woman of literature, May Murr. Along with the traditional delicious Tabbouli, we were served an exchange of poetry and exquisite prose. The bad news coming from the city would stop at the doorsteps of the Murr's residence. Inside, it was intellectually warm, hopeful but slightly imaginary. Aql was invited to serve in the first political coalition resisting the PLO and the pro-Syrian forces, called the "Freedom and Man Front," a predecessor to the "Lebanese Front." In 1982 Said Aql surprised most -not all- Lebanese when he declared his support to the Israeli campaign against the PLO and the Syrian army. His complaint was that it was Israelis, not Lebanese, who were pushing the "occupiers" out. Years later his statements were heavily criticized by many political factions, but his literary legacy wasn't impacted by this attitude. Aql's political position were at the extreme of the traditional spectrum of Lebanese politics, but somehow expressed the feelings of the silent majority. He claimed Lebanon, as a nation, was not Arab, but Phoenician. He accused the PLO and Syria of being the real occupiers and Israel a liberator. 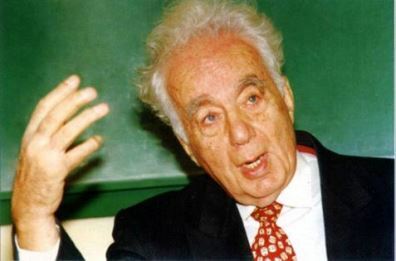 He made no distinction between Christians and Muslims and produced a special alphabet for the Lebanese language, which has ironically become a precursor to the internet written Lebanese language. When I left Lebanon in 1990 I was wondering how will Said Aql "survive" the new environment which had no tolerance for these ideas, even as simple ideas. One of his companions in the Lebanese Nationalist movement, Kamal Yousef el Hajj, had been savagely killed by pro-PLO elements early during the war. Another intellectual companion of the "Lebanonism" ideal, Shia liberal author Mustafa Geha, was executed by Hezbollah in the early 1990s. How did Said Aql manage to live 25 years in what became a "Baathist-Khomeinist occupied Phoenicia" without oppression is a mystery. One observer of the country's modern evolution noted to me that Aql after 1990 didn't produce writings about his once strong stances on identity. "He retreated to literature, because his political visions were more about a fantasy without legs than a real effort to resurrect Phoenicia," underlined the observer, still living in Beirut. The observer stopped short of calling the literary genius a pragmatist. Indeed, Said Aql didn't go to jail as Vaclav Havel did or to exile as Alexander Solzhenitsyn. As with some other Lebanese public figures, he lived through several stages, eras of struggles and eras of accommodations. A trait of Phoenician character, innovation with pragmatism. Said Aql remains an icon in the world of Lebanese and Arab literature. His writings have given justice to Phoenician history, life to modern Lebanese nationalism, and provoked the imagination of many Lebanese on their future. Few years ago I had the privilege to serve as a Doctoral dissertation chair for a brilliant young Lebanese American scholar who studied Said Aql thought at a prominent Boston university. Professor Frank Salameh, now teaching at Boston College captured the "Aqlian" chapter of Lebanon's history. It is now upon a new generation of scholars, like Salameh and others, to resume the journey of men and women like Said Aql. The world has globalized and geography is not an issue anymore. Producing for an idea is not hinging on where you live and under which regime. Thanks to the world wide web one can reform and change the conditions in their birthplace from half the planet away. The issue is to maintain the ideas clear from revisionism. What Aql has called for cannot be changed by speeches to be delivered at his eulogy or re-branded by the dominant political forces. Said Aql was a genius and he has expressed what the essence of Lebanon was and what most Lebanese wanted to see in their future. His legacy won't die.